Cold weather is hard on your skin. You need to exfoliate less in winter, says a common opinion. I disagree. In fact, you need to exfoliate more. Here's why…The less you exfoliate, the more dead cells you'll have on your skin’s surface. This weakens your skin, makes it more susceptible to wrinkling. Failure to exfoliate also accelerates drying. Dead cells can’t store moisture. So, as dead cells accumulate, your skin will become ever more dry. Get a facial brush and start dry brushing your face. Removing dead cells will make your moisturizer many times more effective. Very light, fast-absorbing creams just won’t do for the winter months. They don’t deliver enough protection. You need a cream that offers a moisture lock. The cream acts as an intensive hydrator to maintain your skin’s proper moisture balance all day long. That’s the reason I’ve added breakthrough components to my GLOW cream that lock in moisture. The advanced protective ingredients leave a light film on your skin, sealing in moisture and giving your skin a fresh, supple look. Keep in mind, my GLOW cream is little heavier than fast-absorbing creams. This makes it an excellent primer for makeup. Some customers tell me that, with my cream, they even feel comfortable going out without makeup. When you use a “moisture lock” facial cream, don’t apply it on dry skin. Instead, apply it when your skin is wet. Applying over dampness helps to keep a little moisture on the very top layer of the epidermis. It may take you a few days to get used to a heavier cream. 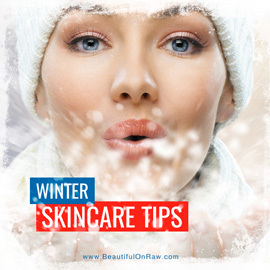 If you’re under forty, use a “moisture lock” cream at least on the coldest winter days—and the hottest in summer. If you’re over forty, and especially over fifty, make such a moisturizer your daily cream of choice. To keep your skin moist and healthy, your best weapon is moisturizing from the inside out with daily juicing and green smoothies. During the cold winter months when nutrients from fresh fruits are scarce it’s especially important to include freshly squeezed vegetable juices in your diet. Atoms and molecules released from the plant fiber during the juicing process contain all the minerals, vitamins, salts, enzymes and amino acids that your body (and your skn) needs. Even those of you with weak digestion can assimilate 99% of the food value available in juicing. 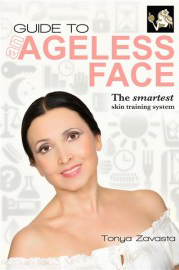 Now’s the time for you to read or re-read my ebook Guide to an Ageless Face. Apply a clay masque. (I use my GlaciClear Masque with Turmeric) After five minutes, remove with a masque-removing brush. Tap-dry gently. Apply oil or my Nourishing Night Cream. Apply RejuvaCup for two minutes. Place a very warm towel—squeeze all the water out—over your skin, removing the excess oil. While your skin is still damp, apply my GLOW cream. There are an endless number of variations you can create in your beauty routine, depending on the time and energy you have, or your mood. One recommendation: Leave a masque and RejuvaCup application, or the Honey Hands Facial for the morning, because these are very energizing and toning practices. And they make you look good within minutes, ready to face your day. As always, I urge you to try whichever techniques make sense to you, and leave the rest. The best beauty routine is the one that works for you! Works for you is the operative phrase. You are always in charge. Of your own health. Of your own beauty. The video below will introduce you to my BASIC morning skincare routine. I do make changes and I like to experiment. I encourage you to do the same.